1. Grease the 10” loosebottom cake pan & wrap a foil over the pan. This will prevent the cheese flowing out. 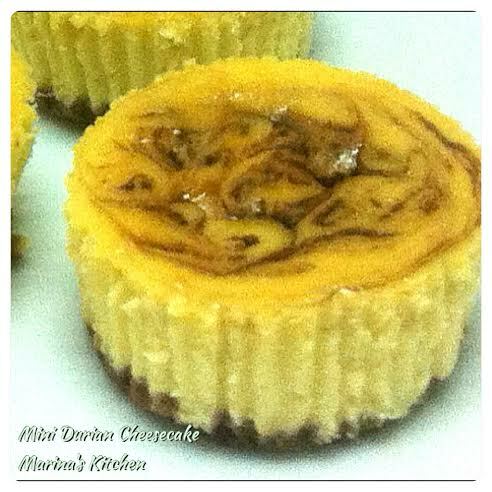 (I’ve use muffin pan line with a paper liner to make mini durian cheesecake instead). 2. In a mixing bowl, combine crushed biscuits with sugar, cocoa powder and the melted butter till well mixed and press onto the greased cake pan. Refrigerate until needed. 1. Preheat oven at 165C. Place a tray of water in the oven for placing the cake later. 2. Combine cocoa powder with melted butter & set aside, this is for the marbling effect. 3. In an electric beater, beat cream cheese with salt, sugar until cheese is creamy. Fold in corn flour and flour until well mixed. 4. Beat in eggs, durian pulp and cream until just mixed. 5. Pour the cheese mixture over chilled biscuit base. Swirl the cocoa mixture to create a marbling effect. 6. Bake cheesecake in preheated oven for 45-55 minutes or until skewer inserted in the centre comes out clean. 7. Remove from oven, leave to cool. Once cool, cut and serve.